How you keep the things around you reflect what's going on in your head. When you see the state of my vanity before, you'll kind of get a peek into my head. About 2 weeks ago, I realized I was wasting at least 5-8 mins of my makeup time just searching for stuff: where's that color tattoo? taupe one, not this black! where are the scissors? where's that lip crayon? the fuchsia one, not this orange! why do I keep finding the same things I don't need?! now where did that black kohl go? not this one, the other one! Those thoughts are usually followed by words I reserve only for scenarios like these. A variety of words in 3 languages - my mother tongue, English & Hindi. So you can imagine how m-a-d I get. The main reason for all this is because I don't have my stack of drawers like I do in India. I can't even buy some here, coz I know I won't be able to take them. 1st Pic: That's how it looked last to last Friday. Yes, utter chaos. I don't know how it got that way. Hair products...Q-tips....hairband.... my shame. 2nd Pic: Clear out the table. 3rd Pic: Clean and wipe table with a damp sponge & some cleaning liquid. Eyeshadow Palettes in a stack on the extreme left. | Cotton buds. | Coconut Candle. | Brush Cup: Reduced to one, and I keep only the brushes that I use more often. | Face Products ~ Foundation, BB Cream, Concealers, Etc. | Highlighter & Bronzer. | Real Techniques Blush Brush & Expert Face Brush. | Most-used Blushes. | Maybelline Color Tattoos & MAC Paint Pots. | In the front are tools & necessities: eyelash curler, eyebrow scissors, tweezers, mascaras, eyeshadow primer, bronzing powder, blush (that doesn't stand like the other ones.). Right side: Jewelry stand: TU from Sainsbury's. More pics here. | Perfumes: Escada Cherry In The Air, Juicy Couture Viva La Juicy, Marc Jacobs Oh Lola Sunsheer, Marc Jacobs Dot. | Lipsticks that I like looking at, and some that I'm currently using. I know in my Vanity Stage 1 post here I said I'd add some stuff here and there, but turned out I was running out of space, and decided to put the products that I use often out in the open so I don't have to search for them crazily. I guess this is the last time you'll see this vanity table, because I'll probably not live here anymore in a couple of months. It's kind of sad, but let's hope the next one will be something I picked out & designed myself. This came with our rented apartment. You know, I wondered why the owners would place that wall mirror so high up. Then one day, I met the couple, and the wife was very tall, maybe 5'8" or 5'9". Now I understand why... hehe! Yup I will gladly help you guys! I wish I could keep things out like that... there's always a layer of dust that follows if I do! I will spend hours arranging it and after a week it same messy. Can you come over and organize my vanity? Pretty please, with a cherry on top? LOL, thank you for inspiring me to finally clean mine! 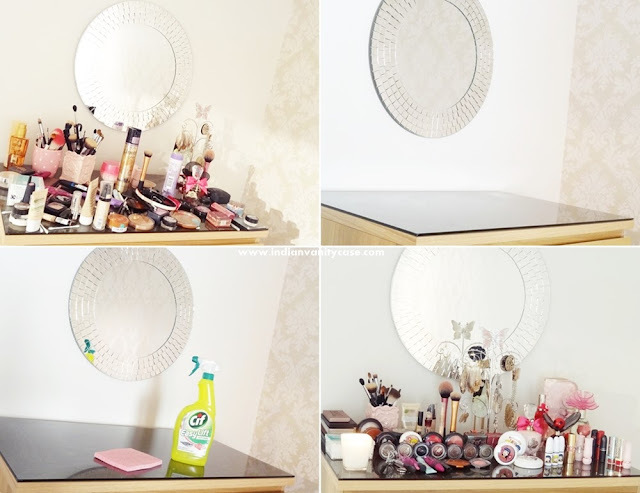 That is high!..I would have to kneel on top of a stool/table to be able to do my makeup on that mirror! !